Chameleon Reversible Thermochromic material is a combination of Leuco Dyes (also known as Colour Formers), Colour Developers and Melt Materials that are all blended together and then microencapsulated with an impervious polymeric wall. This produces an aqueous slurry or concentrate which changes from colour to colourless as the temperature rises , and with decreasing temperature the colour returns. See Graphic 1. The slurry or concentrate is then usually finished into its final form of an Ink, a Label, Plastic masterbatch or a component. When the solvent is solid, the colourless colour former and colour developer precipitate into a coloured complex. Due to the physical and chemical properties of the thermochromic pigments, the visible colour change occurs over a temperature range of approximately 5°C. Additionally it shows a thermal hysteresis, where the temperature at which the colour disappears on heating is higher than the temperature at which the colour begins to return on cooling. Thermochromic Leuco dyes are used in manufacturing and process control, quality control, safety warnings, advertising, consumer packaging, product labels, security printing, anti-counterfeit inks, novelty applications such as temperature sensitive plastics and inks printed onto ceramic mugs, promotional items, toys and textiles. Colour former and colour developer are intimately mixed. When enough energy (mechanic or thermal) is put on the system, colour change is obtained by creation of a complex between colour former colour developer. “(T = 10 K/min)” this should be replaced by ”Scan rate= 5C/min”, as the scale is in Celsius not in Kelvin, and our QC readings are running at 5 C/min. When the solvent is solid, the colourless colour former and colour developer precipitate into a coloured complex. 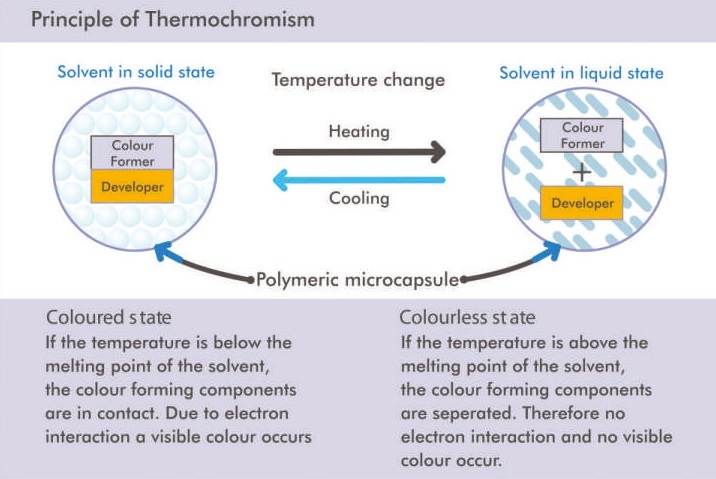 When the temperature is high enough, the solvent is liquid and dissolves the coloured complex into colourless colour former and colour developer.